The Northern Ireland Executive has confirmed water charges will be deferred for another year. Details of a £500m funding boost were revealed as the cabinet met for the first time in almost five months. Ministers have also decided to liberalise restrictions on building in the countryside, replacing the controversial PPS 14 policy. The Executive also reached agreement on the creation of a new education and skills authority. The announcement came as the first and deputy first minister revealed details of Wednesday's negotiations with Prime Minister Gordon Brown. The Executive will use £400m of the money secured from Mr Brown to cover the cost of the 12-month water charges deferral, while £100m will go towards addressing a range of other funding pressures. The Northern Ireland Executive intends to meet every week until a five-month backlog is addressed. 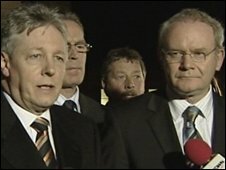 First Minister Peter Robinson told a news conference that difficulties caused by the credit crunch took up more than half of the discussion time. "We have had probably the longest meeting of the Executive," he said. "All of the ministers were fully engaged and there was support from all of the ministers for the work that we had done in securing the arrangements with the prime minister and Treasury. "This perhaps takes some of the pressure off the finance minister (Nigel Dodds) as we move onto the next stage of the credit crunch." Deputy First Minister Martin McGuinness said they had dealt with many important matters. "The issue of the deferral of water charges, the establishment of the Education and Skills Authority, the change from PPS 14 to what will be known as PPS 21 which will allow for development in the countryside in a very balanced way with the need to protect our environment - that should be a boost to local construction workers. "The abolition of prescription charges is another important development which has been mandated by the Executive as a whole." On Tuesday, the DUP and Sinn Féin came to an agreement on policing and justice, an issue which had been causing stalemate. The last time the executive met was on 19 June, after which Sinn Féin refused to sign off on meetings until there was progress on issues such as the devolution of policing and justice. A definite date has still not yet been set, but Mr Robinson and Mr McGuinness have agreed a series of steps designed to bring this about.